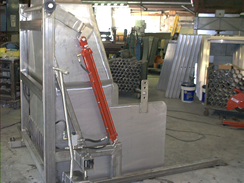 Savaco, Inc. is a complete metal fabrication facility in WNY that works with carbon steel, stainless steel, aluminum and plastic. We serve a multitude of industries, including agriculture, material handling, food processing, health care and pharmaceuticals. Our wide range of services include design, plasma cutting, shearing, punching, press brake forming and welding assembly. We have the flexibility to run everything, from one kind of equipment to complete systems, and from prototypes to large-production runs. By establishing a close working relationship with our customers, we are able to use our specialized skills to compliment the knowledge and expertise of the client's engineering and production personnel. competitive pricing, outstanding quality and on time delivery. Savaco Inc. is a certified WBE.